This is a basic12'x12' o.c., 5 stall barn with Feed Room and oversized Tack Room in the Center Aisle configuration. There is also a Half Bath on the Main Floor Level. The barn level makes the most of it's square footage sense the stairs to the living quarters above are placed outside. The upstairs quarters consist of a Entry that includes a bench seat, a Laundry Closet, a Mechanical Closet and a Coat Closet. The open floor plan combines the Kitchen with eating bar, Livingroom and Dining Room in a non cluttered layout. Down the Hall is a Full Bath and one Bedroom with two closets. The total living space upstairs is about 1,000 sq.ft.of comfortable living. And, of course there is the 10'x14' Deck for relaxing after a day on the trail. This small footprint is ideal for smaller lots where pasture acreage is at a premium. If you would like to see the floor plan, give Karl a call . 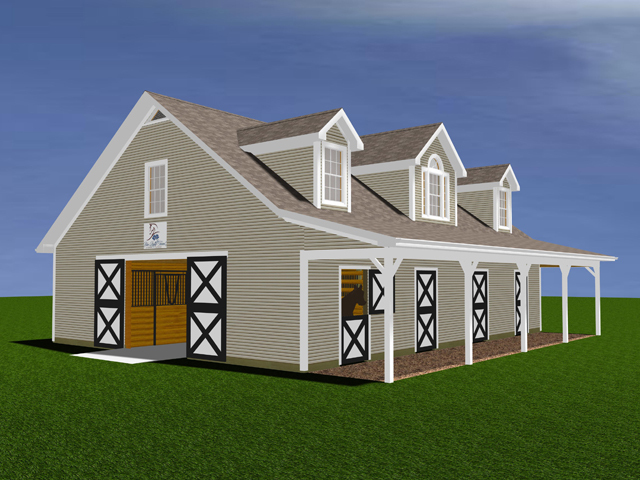 He will come to your Aiken residency and show you this plan and others, or discuss your ideas for designing your dream barn.